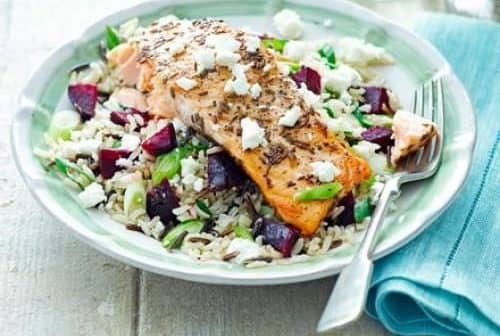 This recipe, I’ve found at the beautiful bbc good food website, combines some of my favourite ingredients to create a quick, healthy, and delicious gluten-free diner. It’s loaded with omega three fats which are good for your heart and your brain, and there is fiber, protein, and slow releasing carbs too. Even if you aren’t gluten intolerant, this is a great dinner and one I love to make a few times a month. More dinner recipes here, or you can find deserts, meals and recipes for kids here. Cover the fish in the oil and spices and then put to one side to marinate. Simmer the rice in a pan with a lid for 25 minutes, over a medium heat. Once 15 minutes has passed, season the salmon and place it skin-side down in a cold, oiled, non-stick frying pan. Cook over a medium heat for five minutes, until the skin begins to become crisp. Turn it over and fry on the other side for a minute or two until it’s cooked the way you like it. Drain the rice and then put it back into the pan. Add the beetroot, spring onions, lemon juice and seasoning to taste and then give it a stir. 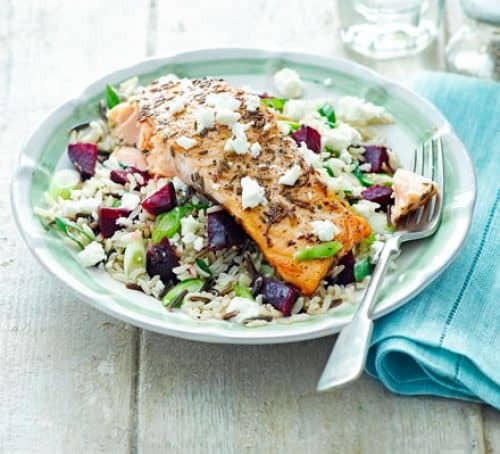 Put the rice on a plate and top with the salmon and the crumbled feta. Finish with a drizzle of olive oil on top. For more information check the original recipe here. I’ve published gluten-free recipes for dinners, desserts and kids, all together in here.